In the 1880s, Jefferson was one of the largest cities in Texas, and the Jefferson Playhouse is one of the most important historic buildings remaining from that period. 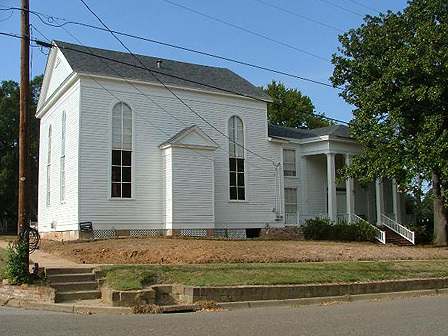 Listed as a Recorded Texas Historic Landmark in 1965 and on the National Register in 1971, its beautiful Greek Revival two-story arched windows and interior woodwork are original. Father Jean Giraud built the structure in 1866 as one of the earliest Catholic convents and schools. In 1965 the Excelsior Foundation purchased and renovated the property. It has been used for cultural and educational events and was viewed regularly by tourists and school children. In May 2004 unusually strong winds caused the front wall to buckle, and the building was closed for safety reasons.